Juan Lorenzo Hubbell was, by most accounts, the leading trader of the early Navajo Rug Period and owned several trading posts around the Reservation as well as a large warehouse in the railroad town of Winslow, Arizona. Hubbells home and base of operation were at Ganado, Arizona about 50 miles south of Canyon de Chelly. Hubbell guided his weavers by displaying paintings of rug patterns he favored. Many of these paintings can still be seen at the original trading post, now preserved and operated as a National Historic Site. 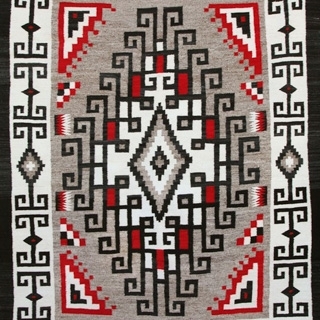 Weavers around the nearby trading post at Klagetoh, Arizona (also owned by Hubbell) often worked in the same colors and patterns as Ganado, but reversed the color scheme and used a grey ground with red, white and black central motifs. The Ganado and Klagetoh style navajo rugs continue to be made to this day and are among the most popular of all Navajo rug designs. Large Navajo Klagetoh Rug, c. 1930, 168" x 104"
Navajo Klagetoh Rug , c. 1925-30, 64" x 39"
Navajo Klagetoh Rug , c. 1970, 109.5" x 74"
Navajo Klagetoh Rug c. 1930, 57.5" x 33"
Navajo Klagetoh Rug c. 1980s, 59" x 42"
Navajo Klagetoh Rug c. 1980s, 62" x 41"
Navajo Klagetoh Rug c. 1990s, 69" x 43.5"
Navajo Klagetoh Rug with Cross Motifs, c. 1910, 94" x 53"
Navajo Klagetoh Rug, c. 1940, 57" x 34"
Navajo Klagetoh Rug, c. 1950, 123.5" x 71.5"
Navajo Klagetoh Rug, c. 1950-60, 83" x 57"
Navajo Klagetoh Rug, c. 1990, 73.5" x 51"
Rose Yazzie - Navajo Klagetoh Rug c. 2015, 37.5" x 28.5"